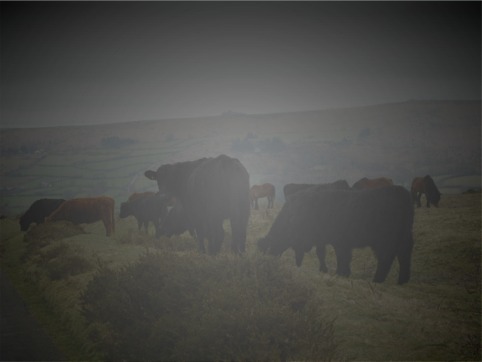 It has been claimed that last year at least 158 animals were killed on the roads of Dartmoor by vehicles. There are signs along most roadsides of the central moorland routes advising people to take ‘Moor Care’. An enforceable speed limit of 40 mph has been put in place in the hope of limiting animal casualties. BUT, what about when animals attack vehicles as they go about their daily business? Ridiculous you say, couldn’t possibly happen! 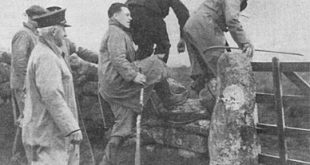 Well now, lets go back to a typical Dartmoor foggy day on the 1st of May 1884 at Pork Hill. On the 5th of September, 1884 a session at the Tavistock County Court one Mr. Thomas Truscott sued Mr. James Perkins for £10 9s 6d for damages which were sustained under most unusual circumstances. So to put some meat on the bones and context to matters, Mr. Truscott was a stable and livery owner from Tavistock and Mr. Perkins was a farmer from Tor Farm, Peter Tavy. John Willing was an experienced carriage driver who did occasional work for Mr. Truscott. Messrs Gibbs and Robinson were the principal and assistant warders from Portland Prison. The time and the place was the 1st of May, 1884 at around 6 o’clock in the evening on Pork Hill. John Willing was driving a closed carriage, his passengers were the two warders who had just delivered a prisoner to Princetown prison and were returning to Portland. The carriage was slowly trotting down Pork Hill at a speed of between four or five miles an hour, the misty moorland gloom was slowly wafting away as they descended. On approaching the bottom of the hill driver Willing noticed four bullocks standing on the near side of the road. He began shouting loudly at the beasts in an attempt to get them to move safely away. Three of the beasts obligingly shuffled away from the road but the fourth was having none of it. In an act of bovine belligerence the bullock stood firmly in the road facing the oncoming carriage. As said vehicle approached the animal it dipped its head and charged at the carriage horse. Now, it’s worth noting here that back in 1884 most cattle were not ‘polled’ or in other words they all had their horns intact. Therefore as the bullock charged into the horse one of its horns pierced the horse’s shoulder, additionally the force of the impact not only dashed it to the ground but also upturned the carriage. Willings was thrown into the air and some seventeen feet across to the off side of the road. Having regained his senses Willings rushed over to the horse which was lying prone in the road. Immediately he noticed a large gash on its shoulder with a huge flap of skin hanging down from the bleeding wound. He also spotted the actual horn which caused the injury lying on the ground, again the force of the collision was so great that it had actually ripped the horn from the bullocks head. By this time three of the herd of bullocks were nonchalantly trotting up the road with the one-horned assailant ambling up behind them. The two warders managed to scramble out of the window of the upturned carriage luckily with only slight injuries. Clearly the first course of action was to get the wounded horse somewhere where its injuries could be treated. Fortunately at that time there was a blacksmith’s shop at nearby Moorshop and so the party retired to there for assistance. So the whole reason for this case was that Mr. Truscott was trying to recoup £10 9s 6d – at least half a guinea for the cost of the veterinary treatment to his horse, £5 19s 6d for the repair of the carriage plus the loss of five weeks work from the horse whilst it was recovering. Truscott also added that he had not had the final bill for the veterinary treatment and it may well end up being two guineas. He also pointed out that the damage to the carriage would entail repairs to the head of the vehicle and re-varnishing. It is worth noting at this point that back in the time of this incident it was a crime to allow animals to stray unattended onto the road. If you look at any local newspapers from that time you will see numerous livestock owners being heavily fined for such a crime. Therefore this was one of the points of law in this hearing. Farmer Perkins had allowed his bullocks to stray onto the road unattended and therefore was culpable for the damages. Truscott also stated that the horse in question was a steady horse of heavy make and that it was incapable of being driven at more than six miles an hour. Following on Truscott related how he had established who owned, by then the one-horned bullock, and demanded compensation them. Farmer Perkins replied that there was no way he was going to stump up unless it was through the court of law. Truscott then replied words to the effect of “so be it.” A few days later Farmer Perkins along with a posse of friends met Truscott at Smith’s coach building yard to inspect the damaged carriage. Having seen the damage one of the posse stated that repairs should be made for which Perkins would pay compensation., apparently he agreed to this. However time ticked on and no compensation was forthcoming and hence the matter ended up in court. The defence for Perkins tried various arguments as to why he was innocent in this matter. Firstly that Willings had in fact driven into the bullock with the carriage due to excess speed, secondly that he was under the influence of alcohol, and thirdly the brakes of the carriage were faulty. It was also stated that the animal had every right to have been there because the common stretched down to where the accident took place. James Reddicliffe, a farmer from nearby Dennithorne Farm also appeared for the defence stating that he had seen both bullocks hair and blood at the scene which suggested that it was the bullock that had been knocked down by the carriage. Another witness stated that he had asked Willings how the accident happened and was told that the brake would not work and the weight of the carriage forced it down the hill. The judges verdict was that there was insufficient evidence to prove that Willings’ carriage had collided with the bullock. He also considered that the fact that the bullock’s horn had been torn off was consistent with the charge that it was the bullock which had charged at the horse – verdict being that the full amount of the claim should be paid. So there you have it, on this occasion livestock for once weren’t the losers. But, take heed, if ever you are driving down Pork Hill on a misty day and meet a group of bullocks be very afraid of one that refuses to budge, especially if it has a set of vicious looking horns.